901. Poor troops are cheap, suitable for padding the number of BGs. In this role their main tactical goal is to avoid destruction. However, they can also delay, guard terrain or the camp, and fight and soak up losses if not subjected to excessive pressure. They can provide rear support only to other Poor troops, but can be used to plug a gap or face to form a front to the flank if in a second line and be sacrificed to draw off enemy in pursuit. Always take opportunities to give your Poor troops rear support from other Poor troops â€“ itâ€™s a cheap way of giving them a +1 on every cohesion test, which when combined with an IC's +2 can make Poor troops seemingly invulnerable to shooting cohesion tests and reasonably durable against enemies in close combat. Their weakness in combat is that 6s get rerolled â€“ a Commander in the front rank of a large Poor BG can fix that, and a cheap small Poor BG behind can provide it with rear support and flank protection that can make it much more durable, but the general rule with Poor troops is to try to hold them out of close combat unless they have an advantage, as needing 5â€™s & 6â€™s to hit and re-rolling those 6â€™s is a very bad combination; although an alternative approach sometimes used is to advance large Poor BGs as bait to tie up a greater number of quality enemy BGs in combat and pursuit. 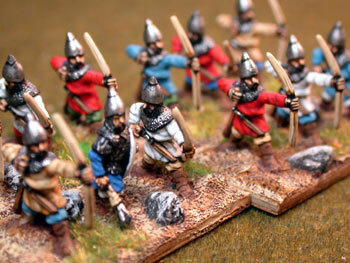 Well armoured Poor troops, or Poor Spearmen, can be an attractive cheaper option to block suitable opponents. Armoured troops of any quality largely shrug off unconcentrated archery, and Spearmen of any quality are capable of seeing off most mounted charges. A large block of Poor Spearmen or Pikemen can serve tactically as a mobile terrain feature that limits the manoeuvre of enemy mounted and provides protection for LF shooters deployed to their front, but it needs a flank guard on the open flank. Poor close combat troops in large BGs can be deployed in extra depth for less frontal exposure and greater resilience. Being cheap, you can afford a large number of Poor troops which can occupy frontage and boost the staying power of the army by increasing BG count and army break point (Poor LF Javelinmen are a great deal at 2 points per base). Quantity has a quality all its own, but to turn that quality to advantage takes more skill and preparation than using more reliable troops. Being cheap, you can afford a large number of Poor troops whichv can boost the staying power of the rest of your army simply by increasing unit count and army break point (Poor LF Javelinmen are a great deal at 2 points per base), and quality has a quantity all its own, but to turn that quality to advantage takes more skill than using more reliable troops. 902. Elite troops are rare, and what is said here about Superiors applies to them. A common opinion is that Elite troops are rarely worth the extra points if Superior is an option, argues the enemy will screen and avoid them anyway, and advances the maxim that if your plan needs Elites, you probably have the wrong plan. Both Elites and Superiors are deadlier in combat, less susceptible to morale failures, and easier to bolster or rally than Average, therefore requiring less personal attention from Commanders and able to keep heavy pressure on their targets in close combat or when shooting and bounce back well in adversity. With rerolls and especially with a Commander, they are very resistant to Cohesion Tests, but they die as easily as any other troops on Death Rolls so donâ€™t expose them needlessly to storms of arrows. 4 bases is a useful size BG for Superior and Elite troops as they donâ€™t autobreak until they lose 3 bases, at which point they would be removed in any event. 6 base BGs autobreak when down to 2 bases. 903. SHOCK TROOPS GENERALLY: Shock troops are aggressive close combat troops with good Impact power but liable to charging without orders, in some cases bursting through and disrupting your own troops in order to charge. An important precautionary rule of thumb is to keep them pointed at their targets but out of charge range until you are ready to charge. Once in range to charge non-shock enemy, donâ€™t dither â€“ charge! Trying to â€œholdâ€ several shock units is usually a prelude to having one or two charge without orders, ending up overlapped and crushed (although this misfortune is less likely with Drilled troops). Keep friendlies other than screening Skirmishers out of the way in the final attack. 910. SHOCK LANCERS: This includes Knights, Cataphracts and Cavalry with a Lancer POA. Lancers in the open give an Impact POA against most troops other than stationary Steady Pikemen or Spearmen, and force a -1 CT Modifier if the enemy are defeated in Impact regardless of terrain. This applies more broadly than the alternative -1 CT Modifier for MF losing close combat to HF or mounted in the open, but the latter applies in Melee if in the open. 911. Only one rank counts in combat, rolling 2 dice per base, so they normally charge one-deep with maybe a base or two in back to fill in for losses (especially if facing shooting on the way in) or to expand in Melee. Some people use 4s, some use 6s. Although 6s are good for staying power and maximizing the benefit of attached generals, higher quality Knights seem to most often be in 4s as this is cheaper in points per BG, easier to manoeuvre, and resilient enough. Except against steady non-charging Spearmen or Pikemen, Knight Lancers in the open have the advantage against Cavalry and MF and are neutral or advantaged against HF at impact, and are almost always at a +POA in melee due to their Heavy Armour, so are suitable for charging into most things not hiding behind fortifications. The counters to Knights are terrain or good infantry â€“ they should beware Spearmen, Pikemen and heavy archery, especially from penetrative Crossbows or Longbows. Proper Knights are Superior (even haughty), Undrilled, impetuous fellows liable to charge without orders and not favoring complex manoeuvres â€“ a sledgehammer. Drilled Knights are much more manoeuvrable and controllable, but even more expensive. If fielding a single Superior Knight BG, I might favor Drilled, but in a large Knight force I would take both Undrilled and Drilled as there is a place for the sledgehammer as well as the rapier and no need to pay extra points for Drilled Knights that will perform the function of Undrilled ones. Knights are almost always a strike force assisted by support troops, but they can also work effectively by assisting their supports. They can work well with friendly shooters by threatening interception if their target charges. They can work with Cavalry or Light Horse to chase off or run down enemy Cavalry or Light Horse, who can catch opponents who donâ€™t keep their distance. When Knights face one-deep evading Cavalry, you need to start the charge within 1 MU of the Cavalry to have decent odds of catching them in an evade. If adjoining LH charge with the Knights, it is very likely the Cavalry will be caught by the LH in Impact, potentially tying them up long enough for Knights that charge short of contact to join in with a charge next turn into the Melee or attack the pursuing Cavalry if the LH break. Cavalry canâ€™t face you frontally, but will be happy to manoeuvre to flank charge you, so Knights need flank protection against them. LH flank and rear charges against Knights can usually be defeated easily unless already engaged from the front. 912. Think of these not as Knights but as unpleasantly slow but heavily armoured Cavalry Lancers â€“ the toughest Cavalry of the pre-1041 era, but outmatched by Heavily Armoured Knights once they make their appearance. Since they fight 2-deep, 6 bases is recommended for Cataphract BGs, fighting either 3- or 4-wide at Impact (depending on the POAs), although they are often seen in cheaper 4s as well. Cataphracts are likely to be at a +POA in melee against most non-anachronistic opponents due to Heavy Armour, so fielding a BG of 6 as Average rather than Superior Cataphracts saves points and remains effective, particularly if led by a TC as is common. As shock troops, even more than Knights they should be careful around undesirable opponents and avoid tarrying under archery. Even if approaching archers unscreened, they should only take one round of shooting at extreme range and one at normal range (when the archers step forward). There is a good change of Disruption, but as shock troops Cavalry Lancers can still charge without a CMT when Disrupted. The "typical" Cavalry unit is 4 bases, but 6-base BGs are a good option for Lancers in order to increase resilience. Additional bases allow them to outnumber enemy "4's" and being able to quickly expand to single rank is not a big issue since they canâ€™t evade anyway, although lightly armoured Cavalry may at time want to deploy in a single rank to face shooting. Undrilled Cavalry have their own column on the CMT chart and manoeuvre far better than other Undrilled non-Skirmishers. The only differences from Drilled troops on the CMT are that they canâ€™t Expand and Advance, and Expansions are Complex â€“ a notable issue for Shooty Cavalry but not Lancers. Drilled is better than Undrilled, but more important upgrades are Armoured, and Superior. Mixing Drilled and Undrilled Cavalry is not a bad idea and can save a few points when topping off an army list. This relatively good manoeuvrability makes lightly armoured (and even Poor) Lancers potentially cost-effective (e.g., Average Unprotected at 8 points) in conjunction with other troops where they can be used for flank charges or for their high Impact against vulnerable opponents. Cavalry Lancers should take full advantage of manoeuvrability in their doctrine and battle plans (see Tip 830 and following). Various Cavalry Lancer armies come with a variety of other troop types to help deliver the Lancers to their targets by covering their flanks and screening, pinning, or engaging other points on the enemy line of battle. LF is always useful as a screen against shooters, to delay enemy responses, or just for Attrition Points. Unless speed of the attack is not an issue, troops fast enough to keep pace with the Lancers are going to make better flank and rear support, although HF is a good choice to fix adjoining portions of the enemy line or as a base of manoeuvre for armies of light Lancers commonly seen in the Middle East. The prospect of facing Knights makes armies with numerous Cavalry Lancer less popular in open competitions, although RBS expects them to be capable in the Legions Triumphant and Decline and Fall themes (where they are most common). 914. â€œSHOOTY CAVALRYâ€: This is Cavalry that relies heavily or primarily on shooting, often used in conjunction with shooting LH. Its close combat power can range from strong to weak, depending on quality and equipment. Ghilman are a tough and common type of Shooty Cavalry â€“ Superior Armoured Bow Swordsmen. Swordsmen capability is common and desirable but not necessary for shoot and scoot tactics. If Unprotected, they should be kept in one rank if in any danger of being shot at. One-deep is also useful to shoot up or chase down light troops or play shoot-and-evade game against heavier cavalry and non-missile infantry. They are usually in 4s to change formation and manoeuvre easily. These troops are simulated nicely in Field of Glory, and it takes talent and experience to handle Shooty Cavalry most effectively, so take extra time in battle drill and combat practice. One common mistake with Shooty cavalry is to take advantage of the possibility evade too often - superior armoured cavalry swordsmen are still very potent combat troops against most enemies, and it is often better to advance in 2 ranks (inflicting more shooting as a result) and take on any enemies in hand to hand combat. The time to commit is once an enemy has gone disrupted, or if they have lost bases - waiting and skirmishing in the hope they go fragmented may well be gilding the lilly. One problem with shoot-and-scoot armies is that wearing down the enemy takes time, which makes decisive results harder to achieve within tournament time limits and can frustrate opponents attempting to close to contact. Except when shooting is massed, its main effect is forcing opportunities for the enemy to fail Cohesion Tests and eventually wearing down enemy morale even if no bases are lost. This is a process of attrition, and very effectively mitigated by enemy Commander and rear support CT bonuses (especially from an IC). Doctrine relies on loosening and stretching the enemy line to create gaps and angles and provoking enemy uncontrolled charges and overextended advances, making it possible to converge shooting and set up flank charges. It is tempting to add close combat troops for offensive power to force the pace and as a threat and deterrent, but they need to be used prudently and avoid becoming exploitable targets for the enemy to mass against due to their inability to evade attacks, although they can be useful as planned bait. For more, see Part 10. 915. MOUNTED CROSSBOWS: In their favor, Crossbows have good armour penetration (e,g., against Elephants, Cataphracts or Heavily Armoured Knights) but they have POA penalties against lightly armoured Foot that are good targets for Bows. Mounted Crossbow LH are most useful against in-period opponents including Knights and Light Foot, and are often the only LH Medieval armies can have â€“ where they have armour, they can also be effective attacking opposing LH. Crossbow Cavalry usually have decent armour and Swordsmen capability, making them circumstantially useful, but unfortunately they are not strong in close combat against Knights, their favored shooting targets, so should play shoot and evade if approaching frontally. Mounted Crossbow Cavalry are also good for sweeping away LH; 4-base BGs facilitate their Shooty Cavalry role. 916. OTHER CAVALRY: This covers other Cavalry in a close combat role, which can include Shooty Cavalry that is doctrinally or situationally relied upon to act in a shock role â€“ if so, having Swordsmen and Armoured is desirable for Melee. They normally fight 2-deep and 6s is the best size for close combat. 4 is brittle against losses but OK with good armour and quality and is suitable for dedicated reserves or flankers. Average Cavalry is safer fighting frontally in 6s since the -25% loss penalty hits them harder as they lack rerolls. Note that Unprotected or Protected Cavalry in normal combat formation of 2 ranks give most enemy shooters a favorable POA. Light Spears are not a full substitute for Lances for Cavalry in Impact, but they have some advantages. The POA is not limited to open ground, is not a shock POA like Lancers that leads to uncontrolled charges, and does not prevent evasion if in one rank (so they can act as â€œheavy skirmishersâ€). However, when used by mounted it is only a tiebreaker, so, if the opponent has one Impact POA, the only way for them to even up in order to count Light Spear POA is if uphill, in fortifications, or the enemy is MF/LF. Therefore the fact that Light Spear is not neutralized by Steady Spearmen/Pikemen rarely helps against HF. Heavy Chariots are the closest thing to Knights in the ancient world and are handled similarly except they also often shoot with Bow, giving them the chance to disrupt enemy with shooting before charging. Light Chariots with Bows can be used like Shooty Cavalry; in close combat Light Chariots are like Cavalry but with twice the dice (this is based on period performance). Heavy Chariots get a POA in Melee, Light Chariots have to rely on their Impact POA to win the first clash and just getting lots of Superior dice in Melee as the only POA they can use is Uphill. Since Chariots fight in one rank, both Heavy and Light Chariots are usually in manoeuvrable 4s. Since they have no armour rating, armour doesnâ€™t affect incoming shooting or melee one way or the other, although they suffer Swordsmen and other Melee POAs used against them. Note that Drilled Light Chariots in march column can turn very handily 90 degrees to form battle formation in a line as a Simple move and can add an advance as a Complex Move, or vice versa, and can expand and advance as a Complex Move. For Undrilled Light Chariots, expansion is Complex and advancing after is not possible. 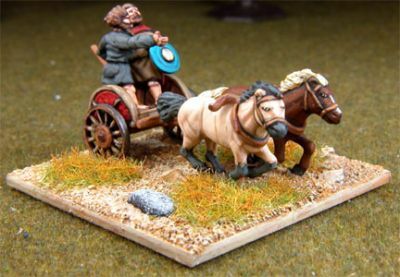 Light Chariots are effective at most Cavalry roles with the advantage of fighting with maximum effect on a broad frontage, meaning they can hold more space on a flank and can outmatch a single Cavalry BG in number of dice rolled in melee. They can manoeuvre and attack on the flanks, but lack the punch of Heavy Chariots. For LIGHT HORSE see Part 10 below. 930. HEAVY FOOT: Heavy Foot are the troops best suited for fighting in line of battle in open ground. They donâ€™t suffer the POA disadvantages that MF face against some opponents in the open and HF are more resilient in CTs for losing a close combat than MF, but slower than MF and suffer more serious disordering effects in terrain. The infantry of an â€œidealâ€ army would include a mix of HF for open ground front-line combat and MF for shooting and use in terrain. Heavy Foot armies such as warband armies are most effective with a combination of HF able to fight in the open and MF to act in terrain, on the flanks, and maybe in reserve, and warband armies often need to take ally contingents to field both HF and MF. 931. MEDIUM FOOT: Medium Foot gives a POA to opposing horsemen on Impact and their morale is more brittle than Heavy Foot when losing to mounted or Heavy Foot in the open (both of which will prove to be very common opponents), but they have an advantage in controlling bad terrain because they are not Disordered by Uneven or Rough ground, move and fight effectively in Difficult and suffer the MF -1 CT modifier for losing to HF or mounted only in open terrain. The counter argument to this is that taking terrain is not rewarded in the game victory conditions, and the MF will in any case have to leave the terrain they have "captured" in order to engage any troops passing them by. Their greater speed makes them useful â€œfoot cavalryâ€ for working flanks (which is often where they find terrain), pressing mounted troops, as good second line troops to provide the CT + more cheaply than cavalry while also being able to maneuver to where they are needed to support the front line, and deep exploitation. Among the most prized Medium Foot are Almughavars (Average Protected Undrilled Offensive Spearmen), Iphikratean Hoplites/Thureophoroi/Thorakitai (Avg/Protected (armored for Thorakitai)/Offensive Spear MF) or Dailami (Superior Armoured Drilled Impact Foot Swordsmen), which can dominate terrain but also be effective in the open. Close combat Medium Foot can be fielded in 6s but without good quality 8s are recommended for cohesion test purposes, staying power, and greater punch in BG-on-BG matchups. 4s can be handy for double-teaming enemy BGs with flank threats or charges. A large number of MF can often influence an armies terrain choices, goals and tactics - but they will still have to beat enemy mounted or HF who wait in the open to win the game. A "few" terrain troops in an army can often get overwhelmed and cut down, so whether it is worth even bothering with "a few" is an important consideration in army recruitment. 8s get you 3 BGs instead of 2 for more flexibility, are manoeuvrable square formations (they turn 90 degrees and remain 2 wide and 4 deep), and their 2-base narrow frontage limits the number of incoming hits by splitting incoming fire among more BGs. 12s are more resistant to shooting cohesion loss and damage, and are said to be less vulnerable to overlaps and being flanked and pounded when they pursue. A BG of 12 can convert to 4 wide 3 deep vs mounted and still be effective, which is more difficult with BG of 8. 8s seem most common, although some players field a mix of 8s and 12s. When there is a choice of Superior vs Poor, the argument for taking superiors in 12s and poor pikes as 8s is that Superiors need to be able to stand up and fight, often for long periods of time. Poor pikes skulk around mainly to try to frighten enemy cavalry, and being 8's they also make smaller targets and are easier to protect. The counter argument is that big Poor units of 12's will take less tests due to their sheer size. There is sometimes the option of taking 10 bases, which are effectively 8s plus the ability to replace lost bases to preserve POAs. At 2 bases wide, the BG still counts as only 6 bases for calculating Cohesion Test effects. Pikemen are typically brigaded in line abreast in order to roll over the enemy. They should press to engage in most cases, and their weakness is that they need flank cover; otherwise, a line of pike blocks will be slowly eaten away from the exposed flank. . Echelons work nicely with Pikemen. They are shock troops, so a combination of uncontrolled charges, pursuits and responding to flank threats can easily leave brigaded Pikemen somewhat scattered and vulnerable to counterattacks by enemy who may be able to engineer 2 overlaps on an over-eager unit which has charged out of line. The combat dynamic against Impact Foot such as armoured legionaries is equality at Impact, with Pikemen gaining the advantage in Melee unless they are Disrupted, in which case the advantage passes to the Impact Foot as they can use Swordsmen to even POAs. Loss of a base costs the Pikemen the 4th rank POA, after which rot sets in. Steadiness in good order is required to deny Swordsmen and Lancer POAs, and the rank bonuses are lost entirely at Fragmented, so bolstering Pikemen should be a Commander priority against Swordsmen. Pikemen against Armoured Spearmen have the advantage at Impact and equality in Melee, but the Spearmen will often fight in deep formation with some bases in a third rank to gain the advantage of being able to replace the fighting ranks and preserve their 2-rank POA while if the Pikemen lose their 4th rank POA they are a POA down. Pikemen (aside from Swiss) are also rarely Superior, so can be brittle in combat-caused CTs. In practice, Pike armies often beat legionary and hoplite-type opponents not with the Pikemen but with their other troops on the flanks while the infantry fight goes on. When advancing, use Light Foot as a screen. Opponents will hesitate to charge them for fear of ending up on the Pikes. Withdraw the Skirmishers ahead of time for a coordinated final charge â€“ against missile troops, you may want to leave them in place and get close enough to uncontrolled charge through them (although against an enemy battle line that means possible piecemeal attacks against overlaps in Melee). 933. SPEARMEN: Spearmen are noted for being good against mounted troops, but have general utility. You can always find something useful for Spearmen to do. Offensive Spearmen are good all-around infantry that are competent against both foot and horse. As MF (such as the highly regarded Almughavars), they are useful for dominating bad terrain and also serviceable in open ground. Defensive Spearmen are cheaper and are fairly common, especially in later eras, and are a good choice for covering a broad frontage on the table and serving as a â€œshieldâ€ wall of infantry and base of manoeuvre for the army. Their disadvantage is that they lose their Impact POA for 2 ranks when charging anything except Defensive Spearmen. Their key advantage is that they neutralize Lancer (and Chariot) Impact and Swordsmen Melee POAs, important in the periods of time in which they are prevalent. Mixing Offensive and Defensive Spearmen can prove tricky as Offensive Spearmen are shock troops easily tempted to break out for formation in charge, and charging Defensive Spearmen have a POA only against other Defensive Spearmen. Protected Spearmen are a lot less capable than armoured ones since the difference often matters both in Melee and when shot at, but they are still a good barrier against Knights and Lancers, and they do require good infantry or converged firepower to crush them. Usually taken in 6s or 8s, Spearmen POAs depend on fighting 2-deep. They start falling apart when they lose the second rank, become disordered, or lose cohesion. As with Pikemen, bolstering them to Steady is necessary for their best POAs, so they deserve special Commander attention. The importance of steadiness also favors using them in 8s to be more resistant to cohesion loss from shooting and allow them to deploy deep (3-wide with 2 bases in a third rank) to replace close combat losses and preserve their POAs. This is more cost effective frontage than deploying 6s in 3 ranks. 934. 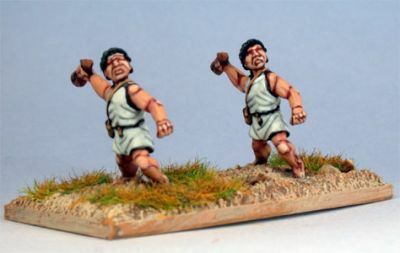 IMPACT FOOT: This is a fairly common infantry type including troops such as most Roman legionaries and â€œwarbandâ€ types. Intended to overwhelm foot opponents by a fierce charge and/or a burst of projectiles before contact, they charge hard against Foot with a ++ POA but are not as versatile against tough opponents as Offensive Spearmen and are not the equal of Spearmen against Knights, or Elephants for that matter. Impact Foot are not regarded with the affection Offensive Spearmen get, but are more resilient as they donâ€™t lose POAs as the BG deteriorates or in terrain. The key issue with Impact Foot is what POAs they have to offer AFTER Impact, in the Melee. For this having equal or better armour is of vital importance. Swordsmen is standard, or Skilled Swordsmen to trump foot Swordsmen (how legionaries prevail over warbands) â€“ but the Skilled Swordsman POA is expensive as it only helps against other foot Swordsmen and Heavy Weapons. 935. LIGHT SPEAR FOOT: Light Spear is a very common Impact weapon type representing a wide variety of troops from earliest times on that were armed with light spears or javelins, thrust or thrown, or with other equipment with similar tactical effect. This POA is a weak sister to Impact Foot, lacking the doubled (++) POA against foot, and is therefore used for Roman Auxilia and some legionaries of the later Empire â€“ but being free is arguably the best value POA out there, applying against all enemies in all terrain and not inducing uncontrolled charges. Light Spear is also a common POA for Mobs or other Poor or Average close combat troops. The real tactical value of a Light Spear BG will depend on whether it also has decent quality, armour and capabilities. Armoured Light Spear MF have the advantages of speed, terrain capability, and not charging without orders. 936. SWORDSMEN: Swordsmen is a widespread and important POA that gives staying power in Melee. Its main weakness is that Undisrupted and non-Disordered Spearmen and Pikemen are very effective against Swordsmen/Skilled Swordsmen because they neutralize the Swordsmen POA. Swordsmen is usually paired with an Impact POA of some kind for close combat troops, and sometimes with a missile POA for shooters, who donâ€™t use it if they are able to stay in a shooting role but may find it useful for purposes such as contesting terrain to obtain shooting positions or if forced to fight hand-to-hand, although they suffer in Melee from having little or no armour. Only a few troops out there have Swordsmen or Skilled Swordsmen as their only POA â€“ they remain useful for overlaps or flank/rear charges. 937. USING MISSILE FOOT: Longbows are the best missile foot weapon. Crossbows have nearly the same penetrating power but their low rate of fire is reflected in negative POAs against many foot targets, making them most useful against Medieval or mounted opponents â€“ Bows are better against the generally Protected/Unprotected troops of earlier eras. Because second shooting ranks shoot 1 die per 2 bases, MF archers are most efficient in 4s (3 dice) or 8s (6 dice) rather than 6s (rounding down to 4 dice), but 6s are more manoeuvrable. BGs of 4 drilled MF shooters are handy for rear support and manoeuvring to add firepower where needed â€“ itâ€™s fairly easy to create a gap they can shoot through. Having a range of 4 MU or more is important â€“ troops with Handguns or Javelins have to get dangerously close to the enemy to shoot. Missile troops are generally more effective against mounted than foot, but can be swept away in close combat by good troops in clear terrain. They do have the advantage of shooting the enemy first: using Bowmen as an example, the Bowmen can theoretically shoot at least two times at long range and two times at effective range at well-handled advancing HF in the two turns they must advance before being in range to charge â€“ note that troops with 4 MU range can get in 3 turns of shooting if they step to just inside range when the HF stop just outside. Against Cavalry, 4MU shooters must step forward into effective range to enjoy one round of full dice before being charged. Fragment the attackers and you win, Disrupt them and you make the charge uncertain for the Cavalry. Enemy Skirmisher screens reduce you to 2 rounds of shooting at the assault troops, none if the enemy is content to wait for the shock troops to burst through the Skirmishers in an uncontrolled charge. In Impact, missile foot stationary and being charged get the benefit of rear rank support shooting (1 roll per base, 1 per 2 for LF), so their BG rolls up to 50% more dice than its attackers, but typically this is at a negative POA needing 5-6 for hits against the 4-6 or 3-6 rolls of the attackers. For all-missile foot BGs, winning the Impact is critical because once it gets to Melee they get pounded to pieces by opponents who may have both better armour and other POAs. Most missile foot are cheaper and cost-effective because they are unprepared for close combat, but some missile foot with good armour and Swordsmen POA can match their likely opponents in bad terrain. It is wasted points to choose POAs that will see little use. In addition to looking for opportunities to converge shooting, missile foot seek ways to shoot repeatedly without being contacted by close combat troops. Drilled archers are worth it for manoeuvrability and afre often able to turn and slip out of the way. A few armies have mixed BGs with shooters able to shoot at full effect from the second rank, and Longbowmen may have stakes to fend off mounted, but otherwise trying to achieve this goal in wide open ground relies on the tactical situational â€“ e.g., recessing them between advanced â€œbastionsâ€ of heavier troops or with an advantage of terrain can allow them to shoot longer, and flank or interception threats can pin down target enemy BGs under archery for a time. Missile foot are strongest behind fixed defenses or taking advantage of favorable terrain. Shooting from hills over friendly troops is good when you can manage it against an obliging target, and a Rough hill in the midst of the battle is an excellent perch for shooters, especially if they are Swordsmen. Any Uneven or Rough terrain that allows them to shoot freely helps missile foot by slowing and disordering the enemy. Shooters with close combat POAs are fairly versatile bad terrain troops at need, although they should beware of tough MF shock troops like Almughavars, Dailami, or good Roman Auxilia. Upgrading shooting troops to Superior where possible is a cost effective upgrade, as the Superior re-roll ability helps in shooting, close combat, and in manoeuvring to either target or avoid enemy, and the added cost is only 1 point if Unprotected or 2 points if Protected. 938. MIXED FOOT: BGs with close combat troops in the front rank and missile foot in the second or third rank appears in various armies from the age of chariots through medieval times, and the purpose of this formation is primarily to defeat or block attacking mounted. They are more effective overall compared with massed archers against mounted, especially Lancers, and they can make a reasonable showing against foot through the ability of the second rank to disrupt the enemy with shooting on approach and in Impact. Although the second rank in Melee fights using the same POA as the same rank, it does not provide rank bonuses so Spearmen and Pikemen POAs are unavailable. Other types such as Heavy Weapon and Light Spear/Swordsmen that donâ€™t rely on rank bonuses for their POAs are happier in mixed BGs. Mixed BGs only shoot 1 die per base frontage and can be outshot by two deep shooters delivering 50% more dice per frontage, but the exchange can be evened up by armour-based POAs. The main purpose of third-rank LF is to save points and provide slightly increased resistance to a mounted charge. A BG of 6 including 2 LF is for must purposes other than the one shooting die effectively a BG of 5 bases. Expensive legionaries can cost-effectively save points with LF due to the cost ratio, while much cheaper undrilled foot will find little appeal in LF that cost not much less than the foot. 939. MOBS: The first reason to take a Mob BG is as Attrition Point filler when you have an extra 16 army points or so. Their combat potential is low and they are not hard to break, but they can serve some useful roles such as Camp guards, terrain troops, diversions, or for facing off Skirmishers. They can also provide cheap flank guard and rear support for Poor troops, such as a block of 12 Poor Pike. Mobs with Light Spears are even more useful, and some armies (Spartacus, Early Crusader) offer Mobs of Average quality which are more broadly useful as rear support. 940. LIGHT FOOT ROLES: LF types were common in most ancient armies for reasons applicable in FoG as well. Light Foot is cheap, particularly the lower grade ones (as cheap as 2 points/base), useful as filler BGs and suitable for early deployment in the order of march. They can stake out space on the first move, they can prevent the enemy from second moving, they can screen heavier mounted or foot against shooting and charge provocations, they can chase off enemy LF, they can swiftly penetrate, hold, ambush from, or harass from terrain, they can distract and divert enemy attention, they can disrupt the enemy with harassing fire, they can assault Fragmented enemy with double their normal dice, they can block or pursue enemy routers to keep them from rallying, they can themselves rout without unsettling heavy troops, and in some armies they can provide back-rank shooting support against mounted in infantry BGs. They were and are used to counter Elephants and Scythed Chariots with shooting. They can move in battle lines with horse and can interpenetrate and be interpenetrated by more troop types than any other troop type. What they can't do is fight effectively hand-to-hand against well-ordered heavier troops or concentrate battle-winning massed shooting as easily as Shooty Cavalry or MF archers. LF have many potential roles, but in practice opposing LF BGs tend to pair off and effectively cancel each other out for the battle, so they are unable to generate enemy shooting Cohesion Tests to support friendly combatants. 941. LF COSTS AND CHOICE: The average LF costs 4 points, Poor 2 points, and Superior 5. Bows or Crossbows have extended range and cost an extra point â€“ other weapons such as Slings, Firearms, Javelins and Light Spears are free. For some tactical roles, BG size, POAs and quality donâ€™t matter, although if they are intended to fight other LF or shoot effectively they become are important. Having a mix of LF types is often the optimal recruitment approach. With only 2 MU range, it is risky to get close enough to use Javelins against anything but slower foot, but their Light Spear POA allows them to drive back other LF with charge threats. Firearms also have a short range, but their shooting has a valuable -1 CT effect that makes small BGs of handgunners useful in support of other shooters. Taking into account cost and POAs, my preference is Crossbows to face armies with Knights, Bows to face other horse and foot (or Slings to save points or if in 4s), and Javelins or Firearms (or Crossbows) to face Elephants. 6-base BGs are reasonably manoeuvrable and work well for shooting non-missile targets. 8s get one more die than 6s at effective range and the same number at extreme range but also require 3 hits before they need to take a shooting CT.
942. LF BG SIZE: 4 LF can shoot 2 dice at normal range, but 6 LF are needed for 2 dice at extreme range and the extra die with a 6 greatly increases the odds of shooting being effective, so Bows and Crossbows should always ideally be in 6 or 8-base BGs while short-range shooters can afford to drop down to fragile 4s and still be able to shoot 2 dice. 4s are ideal for LF taken as cheap filler or a screen to delay movement rather than an active combat role, but are fragile as with a single loss they are down to 1 shooting die and will autobreak on a second base loss unless Superior. Superiors in 4s are a reasonable choice, but all 4s used for shooting should be paired with another missile BG in order to have a decent chance of forcing CTs and doing damage. Large 8-base BGs can have a hard time targeting all their shooting on one target, and a BG of 8 LF fighting alone against two BGs of 4 LF is at risk of being engaged from flank or rear by one of them, causing a cohesion loss that allows the two smaller BGs to prevail. 943. LIGHT FOOT vs. MOUNTED: Enemy mounted are dangerous. Even Poor LH filler BGs can chase down and kill LF in Uneven and Rough as well as Open terrain, although LF like Protected Light Spear Velites become a tougher proposition in Rough. While LH can catch you fairly quickly, Cavalry canâ€™t catch you 1-on-1 before the table edge if you run without worrying about shooting them. If you have two LF BGs against one mounted BG and some room, you may be able to double-team it from two angles and wear it down with shooting, particularly if it is not Armoured. Against mounted in the open, look for friendly troops who can intercept a charge or whom you can evade behind, or have bad ground as a refuge behind you. Beware that mounted may still beat you even in Rough terrain, but you are safer than in the open. Screening your foot from shock horsemen is an opportunity to provoke them into an uncontrolled charge that you evade so that they may run into or close to your foot. Also, since LH in combat canâ€™t evade and wonâ€™t break off against foot that is Disrupted there are times when you willingly entangle them with your LF to enable heavier troops to charge into the Melee and smash the LH. 944. OTHER LIGHT FOOT TACTICS: In addition to the techniques above, against Light Foot you may be closing and charging repeatedly to force them back if you have the tactical advantage, or retiring while the enemy does the same to you. Against slower troops, getting in range to shoot and/or range to provoke an uncontrolled charge is usually the objective. As usual, you are looking for 1 hit per 3 bases to provoke Cohesion Tests. You canâ€™t charge heavier troops in the open, so they can basically ignore you or charge you to make you evade away, but you can keep harassing them with shooting. If you do charge near heavy troops, watch for potential interceptions that will kill you. 950. At 50 points per BG, Elephants are the most powerful and most popular of the exotic troop types, but brittle. They outmatch or equal most troops because they have broad Impact and Melee POAs while also cancelling armour and other common enemy POAs. They get a +1 on Death Rolls, but on the death of a single Elephant base they autobreak and rout twice before vanishing at the end of the Joint Action Phase, so be careful what troops are behind them. The thing to remember is that a bad Death Roll can break them at any time. Elephants are in danger if left alone in the face of the enemy â€“ you want to protect them from shooting and avoid overlaps by having friendlies on each flank or even recessing the Elephants slightly if their neighbors can take an enemy charge without needing flank support. However you do it, donâ€™t let the Elephants become isolated and vulnerable. Even a single winning Elephant BG in the right place can impose a -1 CT on two losing opposing enemy BGs, so they should move as part of a foot battle line flanked by a strong offensive foot BG on at least one side to try to win in Impact by at least a 2-hit margin and therefore maximize the chance of double cohesion loss. In Hellenistic armies, they can usefully be posted on the flank of a Pike block (not in the middle â€“ they create a structural weakness), provided that their flank is guarded by good troops and LF screen against shooting. Paired Elephant BGs are effective and the keys to an Elephant army, each pair brigaded with supporting troops on their flanks â€“ having two or three brigades ensures the enemy wonâ€™t escape their effect. When present in small numbers, Elephants tend to deploy late to optimize their match-ups, either filling in a pre-arranged position of possibly deploying at the join behind 2 BGs who can sidestep to make room for the Elephants to join the line. In larger numbers, some can deploy early, but save at least a few for the later quarters. Elephants are a small, Average BG, so a Commander to help with CMTs and rear support for CTs are both important, but be careful to align rear support troops so the Elephants can rout past rather than over them. Elephants can also attack in conjunction with strong mounted BGs. Disorder should not be a problem for adjoining friendly mounted BGs since only 2 bases of each BG will be in Disorder range of the Elephants, and a die is lost only when 3 bases are Disordered. In either case, Elephants are Undrilled, so you probably want a Commander accompanying the battle line to minimize this problem. Remember that only front-rank Elephant bases count for hits taken per base (each counts as 2 bases) so avoid allowing Elephants to be shot in column since 1 hit forces a test. If faced with Elephants, know that everything that can shoot except Bows and Slings gets a POA against them, and that Elephants lose their usual close combat POAs when they fight LF. Javelin/Light Spear LF are the most useful against Elephants if they can get in range without interference from other enemy. 951. Artillery is situationally useful. It is rarely considered cost-effective for field battles. Artillery has decent range but low (or no if Heavy Artillery) mobility and takes a negative shooting POA against lighter targets. However, Artillery just shooting at a BG forces a CT if the BG takes 2 hits from shooting from any source, regardless of the number of bases in the BG. In addition, any troops shot at by Artillery take a -1 CT modifier. Together these can be quite effective at disrupting large BGs. An Artillery BG is unlikely to score 2 hits itself, so its shooting should be combined with archery to take maximum advantage of each opportunity. Since Heavy Artillery is immovable anyway, taking Field Fortifications allows Artillery and other troops defending them to be placed 5 MU farther forward in the center and better withstand enemy attacks. Field Fortifications, particularly if defended by Artillery, create a zone which the enemy usually avoids. Alternatively, you can place the Artillery without defences where it can create a corridor the enemy will seek to avoid. The ability to channel enemy attack is useful for a defensive or defensive/offensive battle, but Artillery plays little role if the battle is fought nearer the enemyâ€™s baseline. Intervening terrain can be useful to make Artillery harder to attack, and it can be deployed in Uneven or Rough terrain without Disorder. It canâ€™t ambush or go in Difficult, but Difficult or Impassable terrain can secure a flank and help set up a shooting zone at an angle across an enemy line of advance. Since they canâ€™t move elsewhere or pivot once placed, I suggest drilling practice deployments involving Artillery, with or without Field Fortifications, several times before trying them in battle. 952. These slow but hardy moveable forts are available to only a few armies listed below. Only Hussites use them as a primary troop type. They cost from 11 points per base for Poor cheap Indian Bow carts to 26 points for high-end Hussite Light Artillery wagons. In summary, BWGs are slow, reasonably hardy, and cumbersome to manoeuvre. They are effective against Knights, good against mounted, but beatable by good foot. They are most vulnerable to foot that can gain a POA advantage against them in close combat, such as Pikes or Impact Foot, but even inferior opponents can overwhelm them with number of hits if they can converge sufficient shooting or close combat on multiple sides â€“ they enjoy a +1 to Death Rolls, but one failed Death Roll is all it takes to autobreak a 2-wagon BG. Encircling and engaging BWGs on multiple sides is easier because they donâ€™t exert Restricted Areas. When taken in small numbers, they can be used to block a defile, anchor a defensive position, act as a stationary or moving flank guard, or serve as a moving and shooting fortification. In large numbers, their default battle plan is to disrupt and stop enemy assaults by shooting and provide opportunities for the non-WWg fighting troops to engage. BWG tactics and the many special cases in the rules applicable to BWG demand careful thought on doctrine and battle plans and proficient drill alone and with supporting troops, especially because BWGs are not interpenetrable other than by LF, are Undrilled and need a CMT to move, and are slow and cumbersome to manage when they do move. Unfamiliar special rules and exceptions also present a challenge to the player opposing BWGs for the first time, echoing how unconventional Hussite wagon forts confounded their knightly adversaries. Well-played Hussites should be a competitive army, although arguably drawish in timed games since they move slowly and their opponents may be forced to spend a lot of time referring to and pondering applicable rules. BWGs in 2s rather than 4s are recommended. They are much more manoeuvrable in battlefield situations and take the most efficient advantage of the +1 Death Roll bonus â€“ whether from shooting or close combat, two 2-base BGs can expect fewer bases lost per hit than a single 4-base BG. For CMTs and cohesion tests, having an IC is almost mandatory for commanding the wagon fortress. Other than if passively defending around the Camp, consider a Fortified Camp since the supporting troops are likely to be busy coordinating with the BWGs to exploit any opportunities they create. BWGs & Shooting: BWGs themselves can have Light Artillery or Crossbow shooting POAs, each shooting up to 6 MUs from either long side with one die per base width (i.e., 2 dice). Light Artillery is less useful at doing damage than Crossbow, but the target of Artillery suffers negative CT modifiers. BWGs are tough against enemy shooting. Anything other than Artillery takes a â€“1 Shooting POA against them, making it hard to score the 4 hits needed to force a shooting Death Roll. BWGs deliver shooting in one direction most efficiently in a column, but this exposes a lot of frontage and makes it easier for enemy to converge counter-shooting. Note that because BWG shoot to the side it can be hard to make minor changes in the direction of shooting in order to converge damage. shooting if they break off. In fair open battle they can expect to be even or advantaged against anything with a single POA, but foot with a ++ POA such as Impact Foot or Pikes present a serious threat. BWGs and Movement: Itâ€™s easy for BWG manoeuvres to fall into confusion since BWG are slow and awkward, requiring a CMT just to move, and they move in one direction and shoot in another. Their effective positioning and movement requires extraordinary care, including pre-battle drill and contingency battle planning. Their normal formations are march column line abreast (side-by-side). Line abreast is fairly manoeuvrable, as the formation can turn 90 degrees in its own footprint. Columns however move only by wheeling (which kinks the column) or a 180 turn to change direction. BWG columns are too deep to make a 90 turn, though they can expand out into line abreast (or if 4 bases, to 2x2) and later turn 90. Columns allow a BG to deliver full shooting power to one side, and by kinking the column at a sharp angle can take up a corner formation facing in 2 directions. This is good for taking a corner position covering a flank or creating a breakwater against enemy mounted and has the advantage that it canâ€™t be overlapped by enemy at the kink, just at the ends, although in some circumstances attackers may manage to get an extra file in edge contact at the kink. Armies with Battle Wagons in Books I â€“ VIIII (in addition to Hussites (VI: p64) with up to an unaffordable 48 BWGs). III: p16 Early Achaemenid Moveable Towers 0-4 Avg Bow BWGs in 2s. For more on the wonderful world of war wagons, consult the extensive FoG official FAQ at The FoG FAQ . 953. These are entertaining, donâ€™t count towards Attrition Points, and have a decent chance of doing damage to even Elite troops if they can get into contact, but they disappear quickly if things donâ€™t go all their own way. Take them in 2s, aim them towards expensive troops and try to protect them until they get there. They get a POA except against Skirmishers, steady stationary Pikemen/Spearmen, Elephants, Lancers, and Battle Wagons, so Skirmishers are usually sent to defuse their attack with shooting. Their purpose is to get attention and unsettle the enemy â€“ and cause damage if lucky. There are those who take the Pontic army just to get this toy, but most people think they are each a waste of 15 points. 954. CAMELS are fun, rare, exotic, ill-tempered, able to travel with ease in Soft Sand and Disorder horses, but poorly regarded by the FoG lists. 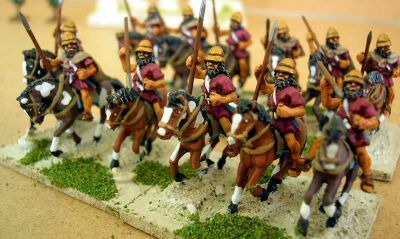 They are currently offered a combat role in only the 8 lists below and all those Camel models for other armies may best be employed sprinkled among the horsemen for color or in Camp dioramas. I: p43 - Later Seleucid Arab Camelry: 0-4 Unprot Poor Und Bow Swordsmen. VII: p27 - Christian Nubian and Beja Camel Riders: 0-24 Prot Avg/Poor Und LtSp? Note: Bedouin Dynasties in Syria and Iraq do not field Camelry. One potential Camel list is Tuaregs, listed as an ally for Early North African Dynasties VII: p55.